I still maintain that fires hold one of the greatest attractions for us humans. And if it's not campfires, it's darkness, or snow, or straw, or simply being with friends. Or perhaps, sometimes it's just enjoying a Fall hayride? Like the one I went on Sunday? After the hayride we all gathered around the fire to eat s'mores, carmel apples, and drink hot apple cider and chocolate. And then for the adventurous ones, there was a wild game of Black Bear. I'm never afraid of the dark, except during this game. Then I sat, staring into the fire. People left, it was only our family, we read worship, and I still sat entranced by the flickering flame. The warmth spreading from the glowing embers, lighting up the surrounding area, holds such deep truths, and yet it's so simple we often miss it while enjoying the fire. While changing the atmosphere around it to a warm and bright scene, it is totally dependent on the cold air and wood around it to maintain it's heat. 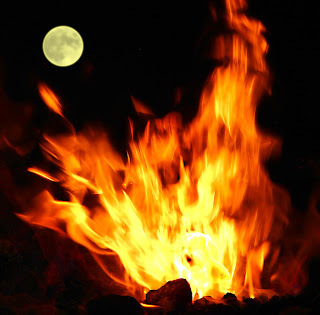 Finally, I decided it was time for sleep… I drowned the fire with water, and watched as the steam billowed upward in eery waves as the full moon provided the lighting. Suddenly the darkness and cold seemed to creep in all around me, and I decided my warm bed was calling!